Although I work in Center City, I rarely get a chance to actually eat out downtown. I try to bring lunch most days and when I need to buy lunch, it’s usually a quick trip to Trader Joe’s, Primo’s Hoagies or Arch Gourmet, the deli across the street. On holidays, I try to meet my husband in his neck of the woods to grab a bite. Although we were prepping our stomachs for our Han Dynasty dinner that evening, we thought we’d grab an early lunch at Marabella Meatball Company, the lunch and dinner spot on 12th and Walnut that was recently opened by the Marabella family of Marabella’s fame. I hopped on the 23 up 11th street and arrived at the front door before my husband, giving me some time to grab a photo and scope out the inside. I ended up walking the path of simplicity and ordered the classic with broccoli rabe (+$1.25,) even though my love for all things little had me leaning heavily towards the slider, while my husband wanted a little bit of everything and opted for the sampler bowl. We each got a San Pellegrino Limonata and the total came to $25 which was a bit more than we wanted to spend for lunch. Hopefully it would be worth it! As we were ordering, I saw the chef (co-owner, I’m guessing?) boiling cauliflower and broccoli for the day’s veggie meatballs. It was refreshing to see that fresh ingredients being used when it is so easy to flash freeze these days. We took a seat at one of their beautifully finished wood tables and waited a few minutes for our food. When it came, it was obvious that time and care had been put into the preparation. 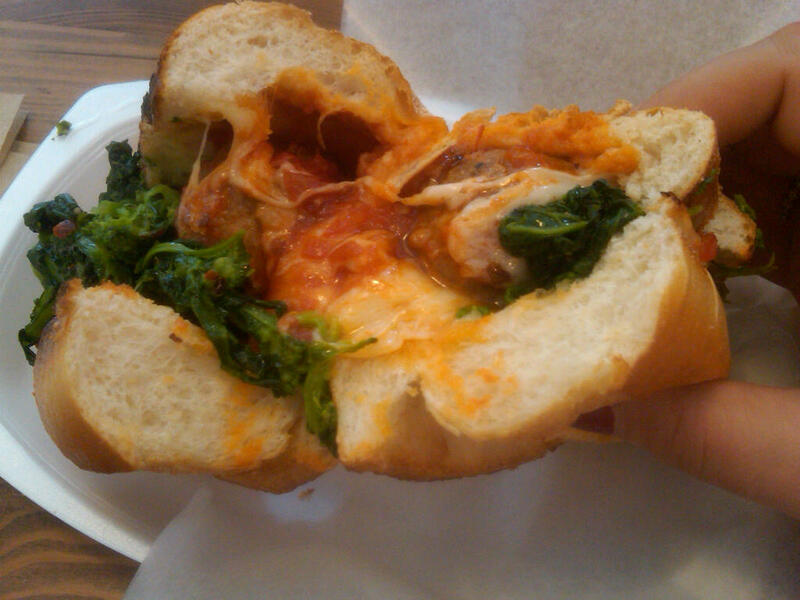 My sandwich was steaming with beefy deliciousness and gooey cheese. Check out an inside view! 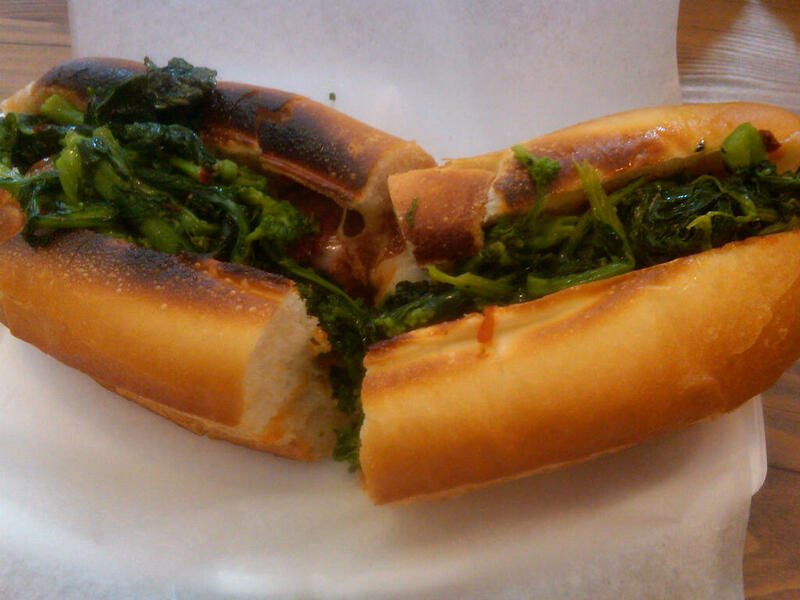 Look at the bright green of the broccoli rabe. Although I do generally prefer it slightly less al dente, I appreciated knowing that it was freshly made and the garlicky goodness just about made up for it. 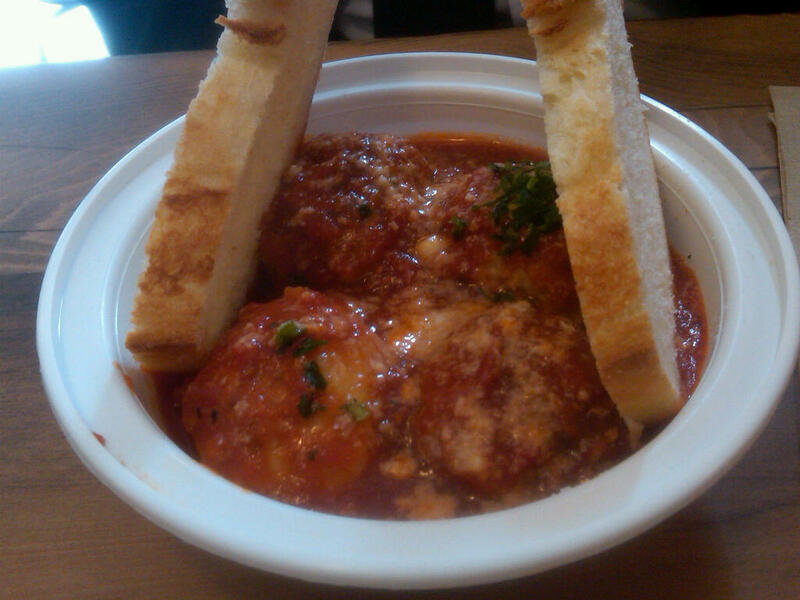 Let’s talk about the meatballs though. Oh, the meatballs. Most folks swear by the meat mix (pork, beef, veal) for meatballs but not Marabella’s. Their beef meatballs are 100% beef. They were dense yet airy and the meatball fell apart in my mouth yet maintained its integrity on the roll. My kinda ‘ball. As I’ve noticed before, however, the real winner of the dish was the cheese. As I savored the tang of the aged provolone, you know, the tang that makes your mouth water just a bit, I considered just how much it added to the dish. Marabella’s definitely doesn’t skimp on the cheese (see picture above) but it is certainly the quality that makes the difference. What a sandwich. The sampler bowl came out in a disposable plastic container which hurt my little green heart a bit but I quickly recovered. I had to taste each meatball. For the blog, you know. My husband has been so nice ever since I commenced my blogging adventure. He quiets his growling stomach when I need to take a picture and he always, always lets me taste. What a guy! He started with the chicken meatball and I can barely begin to describe the morsel of velvety chicken. I barely tasted the “ground” part of the meatball and felt literally like I was biting into a moist and freshly cooked piece of chicken–but better. It was an incredible sensation. I make turkey meatballs at home quite often and have difficulty managing the dryness factor. These meatballs (well, all of them, but most notably the chicken) absolutely nailed it. The next ‘ball I tried was the veggie. First of all, I would like to give MMCo a shout out for not only offering a veggie option but actually putting some thought, time and energy into it. I was a vegetarian for a long time and am no stranger to Morning Star and Boca products but these meatballs had cauliflower, broccoli and chick peas and I COULD TASTE EVERY ONE OF THEM. What a phenomenal and honorable interpretation of a veggie meatball. I loved biting into a little hunk of cauliflower hidden among the sauce. I’m glad I didn’t find a piece of the golden raisins that are supposedly inside because I don’t like raisins. Guess I just got lucky. I didn’t taste the beef because, well, I had beef of my own, or the pork (there’s still a little Jew left in me every once in a while.) I did neglect to mention the two slices of bread that my husband eagerly used to sop of the meaty (or veggie) bits that melted into the sauce. 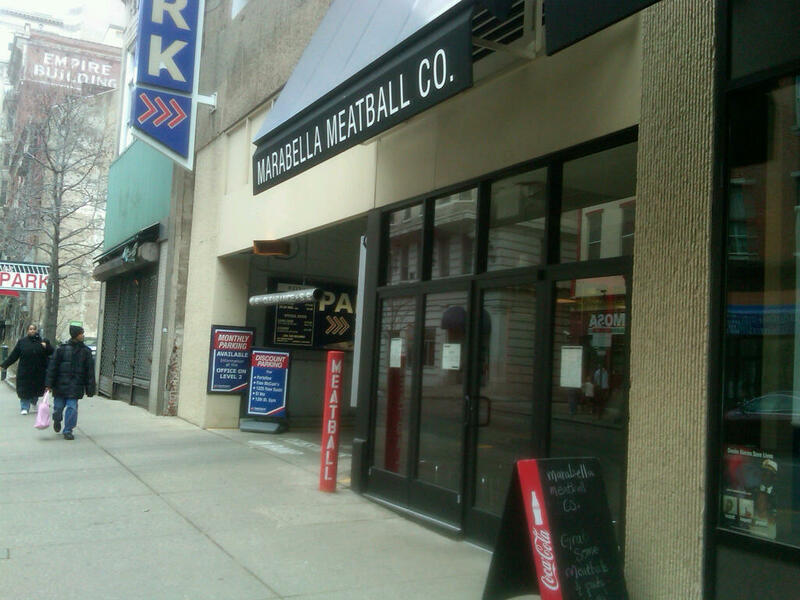 I don’t usually shill places like I’m about to (and I promise I’m not getting anything for it) but I implore you to go to Marabella Meatball Company–and let me know if you want company. I’ll be back for sure. Buon Appetito!